A group of Irish students visited Gozo last Sunday, following a visit to Ireland by a group of Gozitan youths from the Good Shepherd Pastoral Centre of Victoria last summer. Among the Irish students was 16-year-old Alex Harding, whose mother is of Nadur and his father is Irish. The family lives in Ireland and Alex attends the Maynooth Post Primary School. Alex, who in recent years was following his Gozitan family roots and cultural heritage, always wanted to visit Gozo one day in order to share his Gozitan experience with his fellow students. 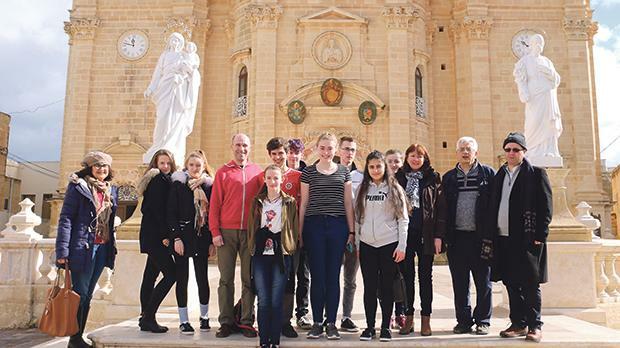 To this effect, the school, through the initiative of the school’s chaplain, Fr Richard Ebejer, Salesian of Don Bosco, organised a four-day tour of Gozo and Malta. The students visited various places, including Ġgantija, the Citadel, the Cathedral, St George’s Basilica, Xlendi, Sannat Cliffs and Ta’ Pinu Sanctuary. They also visited Malta where they experienced the strong relationship that exists between the Irish and Maltese people. The tour helped the students learn more about Malta, its history and St Paul’s journey to Malta. Fr Giovanni Curmi and Dorienne Portelli were instrumental in the organisation of the exchange visit.